« What’s In A View? 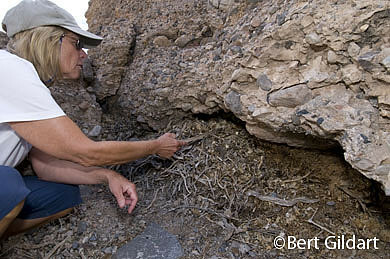 Nancy Dennis examines packrat midden, contends of which can reveal many stories. ©Bert Gildart: Revolting as it may sound, much of the information about the character of Death Valley has been obtained from packrats and from the feces and urine they have deposited over the millennium. That’s what we spent much of yesterday doing, but certainly not the entire time since my last posting of several days ago. Since that time, we have taken a short break from Death Valley, making a two night stay in the nearby town of Pahrump. We wanted hookups and access to cable TV so that we might watch the historic inauguration. From Pahrump, we also said our goodbyes to Rich, Emma and Eleanor Luhr who had camped with us for several days at Furnace Creek. Our objectives complete, we returned to Death Valley and joined some other Airstream Trailer friends (Don and Nancy Dennis) whom we meet last summer in Glacier National Park. Don is retired from a dual career with the forest service and as a college professor. Nancy is retired from a career as an administrator with various companies, and because of their obvious interests in the outdoors, they were an ideal couple with whom to search for packrat middens. By definition, a midden is a refuse pile that has accumulated over the centuries, and that is what packrats have provided in this valley now known as Death Valley. Thousands of years ago, a pair of packrats found a location that seemed ideal as a home and then began building a nest, using whatever vegetation was available. 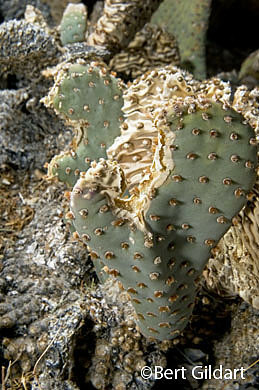 Nibblings of packrats suggest the capabilty to avoid thorns. In this way they had some fairly conclusive evidence testifying to the nature of the climate many years ago. Hopefully, before leaving here, I’ll be able to visit with one of the biologists Terry said would be available later in the week. In their voices was genuine enthusiasm, making this the very best crew with whom to be hiking! Our midden was located high on the flanks of the wash at the base of a huge boulder. Because such washes can at times funnel large quantities of flood waters, it would seem these rats had selected well. Other than that I can’t report much other but can say that the midden was large and that it seemed quite varied in construction. Tangentially, I can also report that the rats seemed immune to the cholla from which a part of this particular nest seemed to have been constructed. We also observed that nearby they’d been nibbling on beavertail cactus, and that packrats have apparently learned how to avoid the thorns. One more thing I can confirm is that the nest was laden with feces and that it had a pungent odor. Of course, you’ll want to log in again to discover whether my passion about packrat poop has waxed or whether it has waned. In fact, you may want to look us up down here where we are camped way below sea level. You’re welcome then to join us as we search for yet more middens, so very rich with story-telling feces. This entry was posted on Friday, January 23rd, 2009 at 10:36 am and is filed under National Lands, Photography, RV Travel. You can follow any responses to this entry through the RSS 2.0 feed. You can leave a response, or trackback from your own site.